Very Reverend Fr. Joseph J. Allen TH.D vividly remembers the first time he experienced some dizziness and problems with keeping his balance. He was serving the liturgy and it hit so quickly, he had to hold onto an altar boy's shoulder to keep from falling. But just as quickly as it occurred, it disappeared. Until it happened again. And then several more times – without warning or in a discernible pattern. 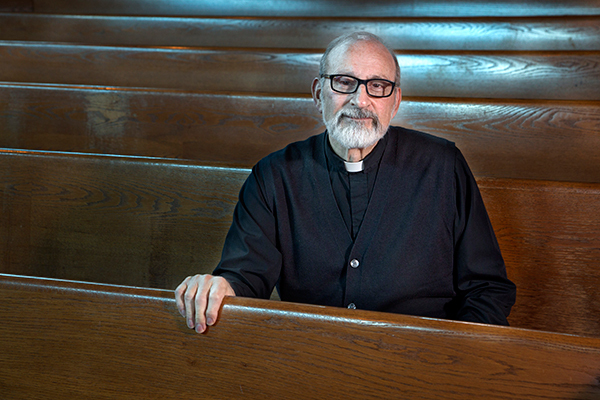 Father Allen, 75, sought out the care of several doctors, who found he had a disorder with his vestibular system – parts of the inner ear and brain that help control balance and eye movements – and they recommended he go for physical therapy at Holy Name Medical Center. "Someone at another hospital even recommended Holy Name and I can't tell you how much it has helped," said Fr. Allen, the leader of St. Anthony's Greek Orthodox Church in Bergenfield. "The therapists there are just fantastic." People suffering with vestibular disorders may experience vertigo and dizziness, imbalance, vision disturbances, hearing changes, spatial disorientation and other symptoms. Movements may exacerbate the symptoms. "All the liturgical movements – raising your hands above your head, turning around, bowing – they can all make things worse," said Fr. Allen. "I have to learn to make all my movements slowly." Fr. Allen said in therapy he is working on walking, turning and his balance. He said he's also learning how to strengthen his legs so he can catch himself if he feels off-balance. Vestibular disorders often become chronic, hitting hard and then ebbing or disappearing for a time but frequently returning unexpectedly. Often, aging plays a role in the development of the condition, but it can also be triggered by accidents and illnesses. "You know sometimes you have to make adjustments in your life to what you have to live with," Fr. Allen said. "I was trying to adjust to living with constantly feeling light headed, dizzy and off-balance. But now I see it can be so much better." In Fr. Allen's case, he doesn't know the cause and it has never gone away completely but he had to stop therapy for a while when he travelled to Europe and the difference in how he felt was drastic. "Even though I was doing some exercises on my own, I realized I had to go back to therapy as soon as I returned from my trip – it made such a difference in how I felt," Fr. Allen said. "The therapy is very beneficial." Holy Name has physical therapists such as Susan Philip, one of the most recognized vestibular specialists in the North Jersey area, who are extensively trained in vestibular and balance dysfunction. They provide comprehensive evaluations and individual treatment plans to improve function and prevent falls.